I am still mulling an experience I had last week. I was invited to address the student body at a private high school here in Virginia. I accepted the invitation eagerly, since I am on a mission to speak with audiences wherever I can, about climate disruption and the urgent need to act. While most of my talks have been to adult groups like Rotarians and Lions Clubs, I have recently begun seeking opportunities to talk with younger people. 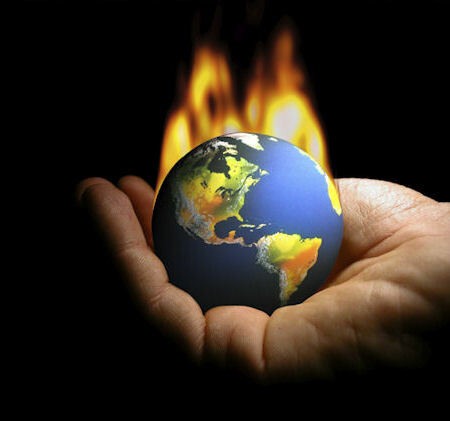 Despite my motherly hesitation to burden young people with such a heavy message, I decided that since young people are the ones who will be spending most of their lives on a dangerously warming planet, it is not doing them any favors to refrain from helping them understand and deal with the difficult situation they are facing. I looked forward to addressing the group of 120 freshmen, sophomores, juniors, and seniors. It would be my second time addressing high school students. My previous talk, with a group of bright seniors, had been well-received. In my talk to these students, I focused on the fact that 97% of climate scientists are telling us that the earth is warming, due largely to human activity, and that we must take urgent action to avoid the most catastrophic impacts. I also discussed a key reason why we are not making much headway in dealing with this emergency–the deliberate misinformation campaign, being waged by the fossil fuel industry, to sow doubt in the minds of the public. This strategy is succeeding, in that it lulls a large proportion of our citizenry into a false sense of security. Also, there’s no way of explaining our nation’s continuing inability to act responsibly in the face of this crisis without saying something about how this same well-financed force is being served in the arena of political power. Even knowing that some of the students in the room identify themselves as Republican, I described some of the obstructive actions being taken by today’s Republican Party, efforts that help keep our country from dealing effectively with climate change. Looking about the room as I spoke, I could see that most of the students were listening. And during Q and A, there were plenty of questions, none of them hostile. Later, however, I heard from one of the teachers that there had been more going on with some students than I’d realized. While some were so inspired, they were ready to call the White House immediately, I was told, others were enraged. At least one teacher had to spend some of the next class period defusing those students’ anger. Some felt I had unfairly blamed Republicans for everything. And there is talk, I was told, of bringing in another speaker to represent a conservative perspective. My first response to the feedback was to try to figure out some way that I could deliver my message so that everyone would respond to it favorably. If I were pleasing everybody, I came to realize, I wouldn’t be doing my job. We’re in a situation where it’s not just a matter of filling the void of ignorance with knowledge, but of helping the truth to push aside a well-entrenched lie. While it saddens me to cause any of these young people distress, I also recall that the healing of our sicknesses sometimes entails, in the short term, greater discomfort. It’s Spring–The Shadbush Is Blooming! For the last week or so, my forest walks have yielded a special delight. Here and there, against the still-winter grey of the forest, is a full, rounded, bright spot of white. It’s the serviceberry, or ‘shadbush,’ in bloom. This slender little tree signals that spring has indeed come to the forest, and soon other trees–the dogwood and the redbud–will follow along with blooms of their own. But the serviceberry is first. I have long heard that the reason the serviceberry is also called ‘shadbush’ is that the tree blooms just when the shad are spawning. I like the folklorish sound of that and decided to learn a little more. But the serviceberry has another name, ‘ juneberry,’ for its dark, blueberry-looking berries that ripen in early summer. These berries are a big hit with many birds–bluebirds, cedar waxwings, robins, ruffed grouse, and pheasants, to name a few, and also with foxes, bears, and other mammals. 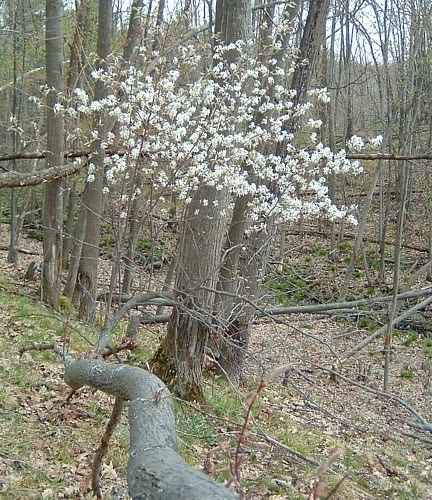 The name serviceberry has its own folk history. All three possibilities I’ve heard for the name’s origin have to do with church services. One is that the blooming serviceberry in Appalachian forests meant that mountain roads had become passable again after the winter snows, and that church services would resume, since the circuit-riding preacher could now make it to the small country churches. Another church-related explanation is that the blooming of the serviceberry coincided with Easter services. And the third, that with the blooming of the serviceberry and the passability of the roads, funeral services could now be held for those who had died during the winter. In learning about some of the serviceberry’s other names, I inadvertently solved a small mystery that had arisen for me many years ago. I just learned that a name for a western variety of serviceberry is ‘saskatoon.’ Many years ago, on a family trip in Montana, we encountered saskatoon berries. I had never heard of them and wondered where they grew. No one I asked seem to know, but I assumed they grew on some shrubs in that area. Now I know that saskatoon berries are from a type of serviceberry tree that grows in the mountain west. So not just animals enjoy the fruit of the serviceberry; we humans do as well. I have been thinking lately that we live in a highly unusual time. But because we have no direct experience of any other time in history than our own lifetimes, it is natural to look around us and assume that what we see is normal. And if it’s normal, then it must be okay. But what is happening around us on our planet these days is far from normal. And it’s far from okay. For example, amphibians, mammals, birds, and other animals are disappearing rapidly, at a rate far higher than normal. Scientists tell us that a major cause of these current extinctions is the changing climate. Habitat loss and habitat degradation are also playing a role. Even knowing that today’s extinctions are abnormally numerous, I was shocked recently to learn that the current rate of extinctions is SO high that scientists are calling our time “the Sixth Extinction.” In other words, current extinction rates are comparable to the five major waves of extinctions the planet has experienced in its entire 4.5 billion year history! THE SIXTH EXTINCTION: AN UNNATURAL HISTORY, by science writer Elizabeth Kolbert, introduced me to the term ‘background extinction rate.’ This is the term biologists use to describe the rate of extinctions that would occur naturally, if human impact were not a factor. The background extinction rate for amphibians, reports Kolbert, would be about one species lost every 1,000 years. Yet I know of at least three frog species that have gone extinct in just the last few years. And the background extinction rate for mammals? One mammal lost every 700 years. Yet so many mammals have been lost during just the last decade–the Baiji dolphin and the Pyrenean ibex to name just two. And so many more are on the brink– at least three rhinoceros species, two seal species, the Asian elephant. And many, many more will soon likely disappear forever. I find these numbers staggering, and, frankly, nauseating. The background extinction rates for amphibians and mammals are so low that most humans should not experience the disappearance of an amphibian or a mammal in their lifetime. Yet how frequently we hear of some animal that has left us forever or is hovering on the edge. Tragically, such news is commonplace for those of us living today. It seems normal to live with mounting losses of our fellow creatures. It weighs heavily on me that we humans are so focused on ourselves and our own needs and desires that we are depriving many of our fellow species the ability simply to live. Last month, some of the most beautiful land in America was designated a wilderness, the very highest level of protection available for any public land. The newly protected area makes up almost half of the existing Sleeping Bear Dunes National Lakeshore, an area along the northeast shore of Lake Michigan. The 32,000 acres of newly designated wilderness includes miles of sandy beach, parts of two islands, dense forest, bluffs that tower hundreds of feet above Lake Michigan, clear inland streams and lakes, and unique flora and fauna. Also protected will be such cultural features as a historic lighthouse, old farmsteads, and existing county roads. This area was named “The Most Beautiful Place in America” by the TV show Good Morning America. The public will still be able to enjoy the protected wilderness. Visitors can fish, hunt, and camp in designated areas. But motorized vehicles, mining, logging, new roads, and permanent structures are all prohibited. This wilderness designation is the result of a rare show of bipartisan support in Congress. Both the Senate and House passed legislation to establish the wilderness at Sleeping Bear Dunes. And in the case of the House, approval was unanimous! President Obama signed the bill into law on March 13. This is the first time since 2009 that both houses of Congress have voted to provide wilderness protection. The five-year ‘drought’ from 2009-2014 is far from typical in such designations. From 1964, when the Wilderness Act was created, to 2009, every Congress designated at least one national park, monument, or wilderness. To qualify for wilderness designation, a piece of land must be at least 5,000 acres large or a roadless island. It must appear natural, with no noticeable human presence. It must provide space for recreation and solitude, and it must contain features deemed ecologically, historically, or culturally significant. The Wilderness Act established the National Wilderness Preservation System to protect all federally designated wilderness lands. When the Act was passed, nine million acres were brought into protection. Now almost 110 million acres are federally protected wilderness About half of those acres are in Alaska, although 44 states and Puerto Rico contain wilderness land. Protected wilderness can be found in national parks, national forests, wildlife refuges, and in the public domain. You are currently browsing the Earth Connection blog archives for April, 2014.